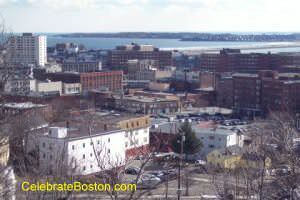 About 11 miles north of Boston is the city of Lynn Massachusetts. A great conflagration took place there in November, 1889. The heart of the business district was completely destroyed, from Central Square to the sea. "To those who had nothing personally at stake, the start and spread of the fire and its consequent scenes of terror and confusion was an excitingly interesting experience; but to those who saw going down in the flames their homes, or the factories and stores that gave them their daily bread, it was a sad and appalling sight. Far worse yet was it to the enterprising business men of the place, whose property was melting away before their very eyes at the cruel touch of the roaring flames. The best part of Union street lay within the present burnt district, and the big shoe factories on this street met the fate of the others. Sparks swept across [Central] square and set fire to Pike's cigar store, on the corner of Monroe street and Central avenue, and edged back toward the Eastern Railroad tracks. The wind was blowing towards the east, and carried the flames off in that direct for a while. One side of Mulberry street, the south side, was partly burned. These were mostly wooden buildings and did not stand much chance against the fearful heat and the clouds of flying sparks sweeping toward them. The fire worked along down the street toward the Sagamore Hotel, went diagonally and in an easterly direction across to the tracks, sparing the houses on this block fronting Silsbee street. The wind did not remain in the east very long, but turned back in a southwesterly direction. It swept in the new path it had taken down the Eastern railroad tracks two-thirds of the way to Market street. In their march the flames reached over and took a death hold upon the Eastern railway depot, a structure built mostly of iron. The iron skeleton, blackened and warped, is all that stands now. Every particle of wood-work was devoured. It was only by serious efforts that the station agent succeeded in getting out the tickets and other small movable property of the railroad. On down Union street in the other direction the flames went, eating up the entire block bounded by Union, Washington, Spring and Exchange Street. This is a three-cornered block, and contained a great many wooden buildings. But wood and brick alike went, and when the walls had fallen the smokestacks stood up wreathed with the smoke from the embers below." The militia was called up to prevent looting. 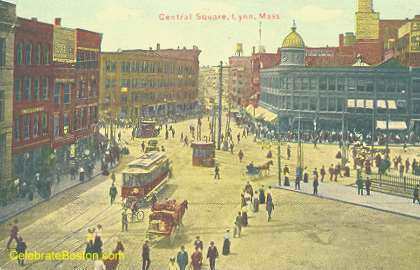 The Great Lynn Fire was sadly a spectacle. About 17,000 people took the Boston, Revere Beach, and Lynn Railroad to gaze on the fire. The BRB&L Depot was just south of the fire zone, and many spectators watched the flames from along the railway tracks. Buildings were completely destroyed in Central Square and on Mount Vernon, Almont, Union, Exchange, Broad, Spring, and Beach Streets. The fire spread south to the sea, which prevented it from spreading further in that direction. The fire continued to burn until the early dawn on November 27th.